It’s been three years since our Mountain Weather Resources web page has been updated. During this time some links have vanished and new resources have arrived. We maintain this information because there are few useful forecasts for mountain travellers. Public forecasts are designed for urban areas and airports. 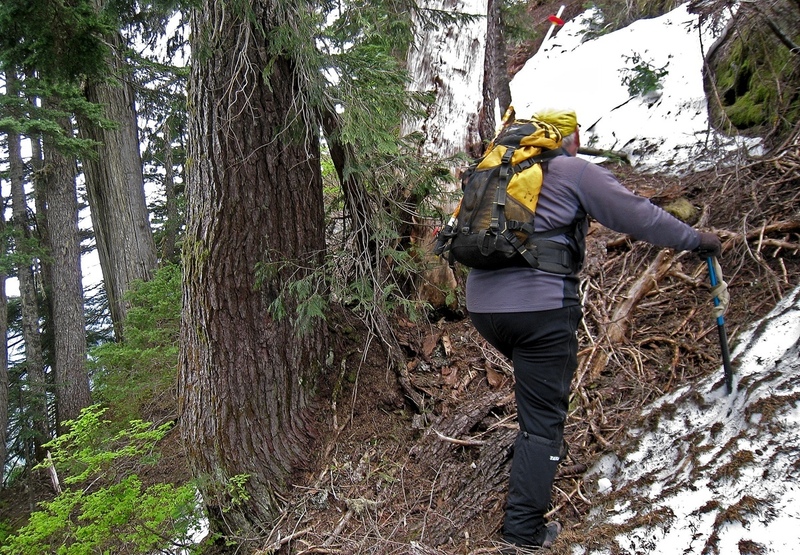 It may be a benign rainy day in downtown Vancouver, but above 5,000 feet in the hills north of Squamish, backcountry skiers could be navigating the sub-alpine forests or high ridges and glaciers in a blizzard with fierce winds. With some thought, planning, and the amazing forecasting tools available, this is not a surprise. Here, on the Canadian west coast the weather usually arrives from the Pacific Ocean and performs a dance with the mighty hills, valleys and fjords. Part of planning a trip into the mountains is knowing the land forms and anticipating how the weather systems will behave. Click here for Salish Sea Mountain Weather Resources. A decade ago my teenage daughters and our friends loved building igloos. I was surprised when I was requested to facilitate an igloo on New Year’s Day. 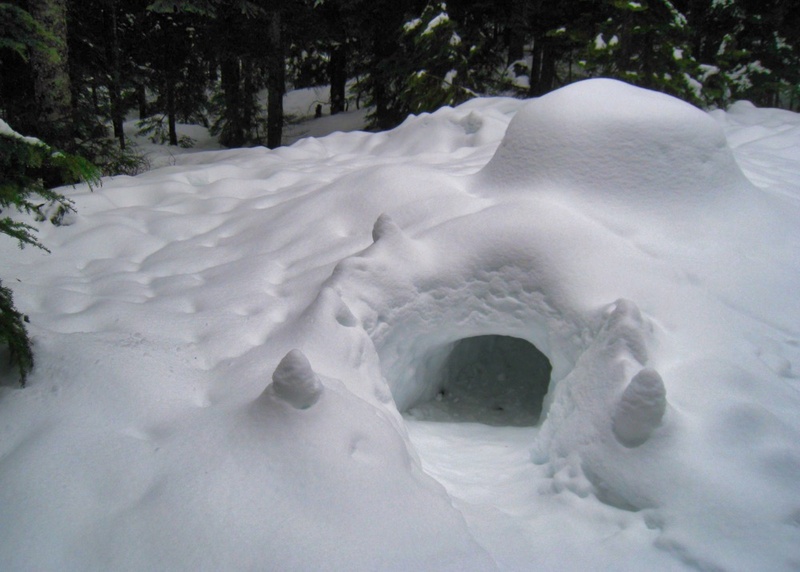 Eight of us worked all day to build a 9-foot inside diameter igloo on Hollyburn Mountain, at 3020 feet, just up the hill from West Vancouver. Dave took a time lapse of the construction. In the week that has followed, the weather warmed and there was lots of precipitation. Because of a local inversion, the temperatures at the altitude of the igloo meant that it rained… and then snowed. 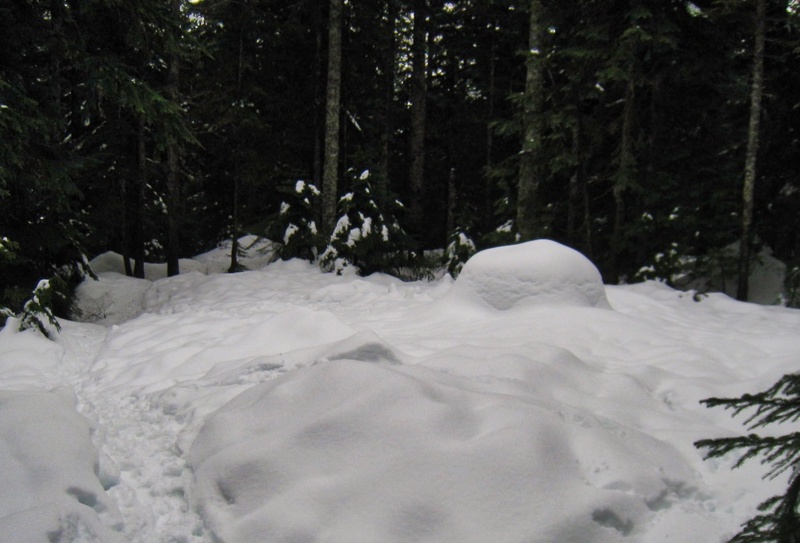 Today, January 9, I was in town, drove to the trailhead, and walked into the site of the igloo. Here is what I found. When I arrived, all I could see of the igloo was a blocky mound in the snow. The catenary profile was gone. Had the igloo collapsed? I cleaned up the doorway in preparation for entering. Note the size of the shovel compared to the height of the igloo. When I tried to sit on the floor of the igloo, with my legs in the entryway, I would bump my head on the roof. When the igloo was built, the top of the roof was 170 cm above the floor. 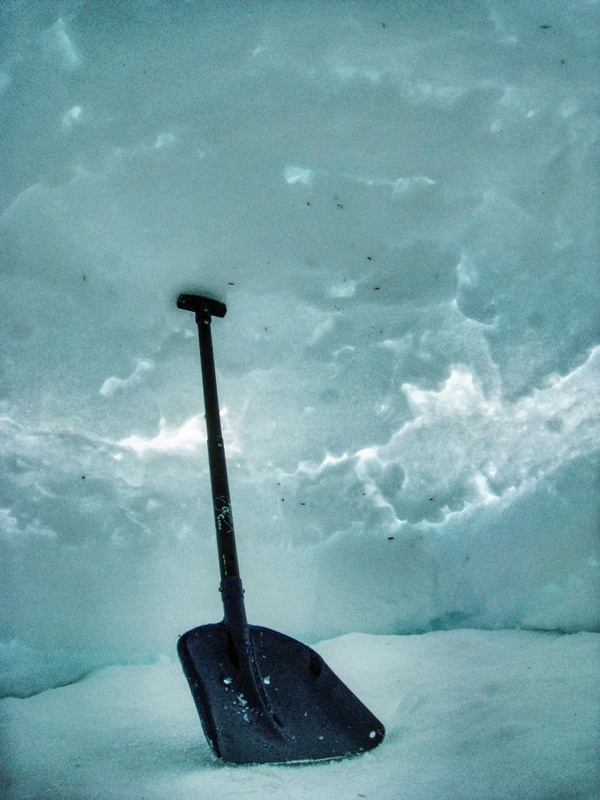 Here, I cannot stand my shovel, and it is about 40 cm long. The igloo is slowly collapsing — like a balloon deflating. 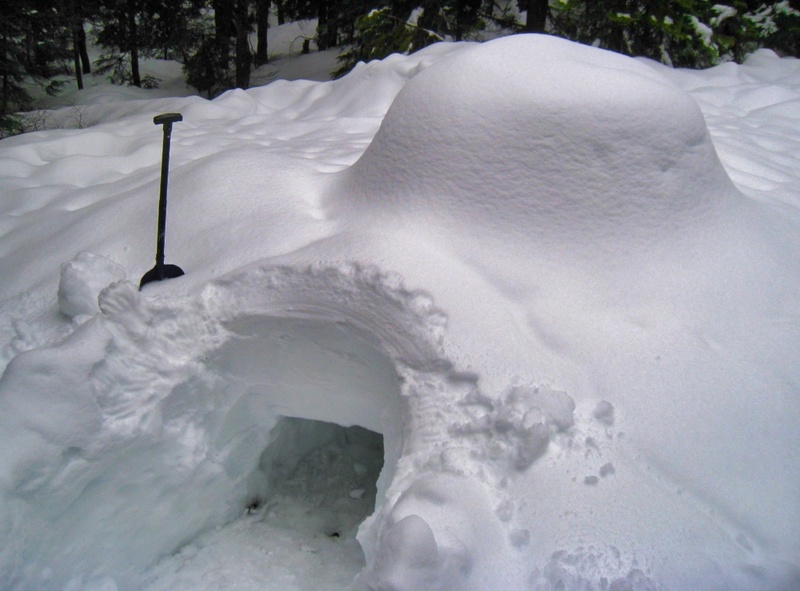 There is a post about the plan for this igloo, and reports of our earlier igloos on the local hiking forum: Clubtread. Scroll the three pages of that thread for more details. 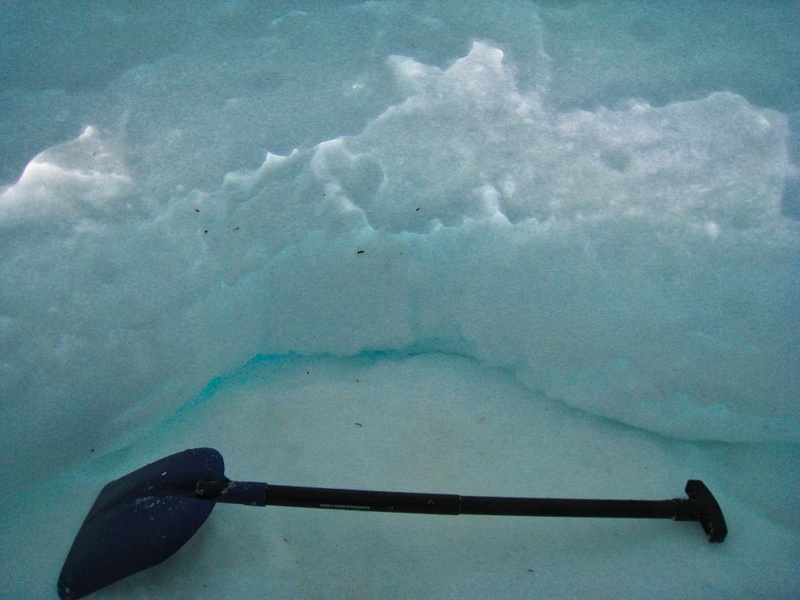 The tool we use to make the igloo is Grandshelter’s Icebox®. We’ve made many igloos since we acquired it in the year 2000. At this low altitude site, which is only a few hundred feet above the snow line, we don’t expect the igloos to last long. 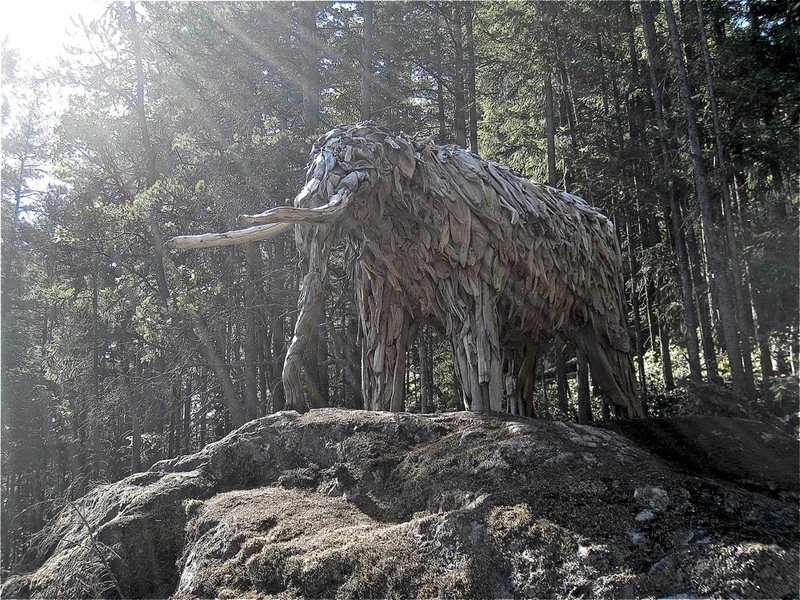 In a shady spot above 5000 feet, we might expect these structures to last for weeks or months. Sunday, May 7th was a stunner – deep blue sky, temperatures just above freezing, and the local mountains were making some of their own cloud. 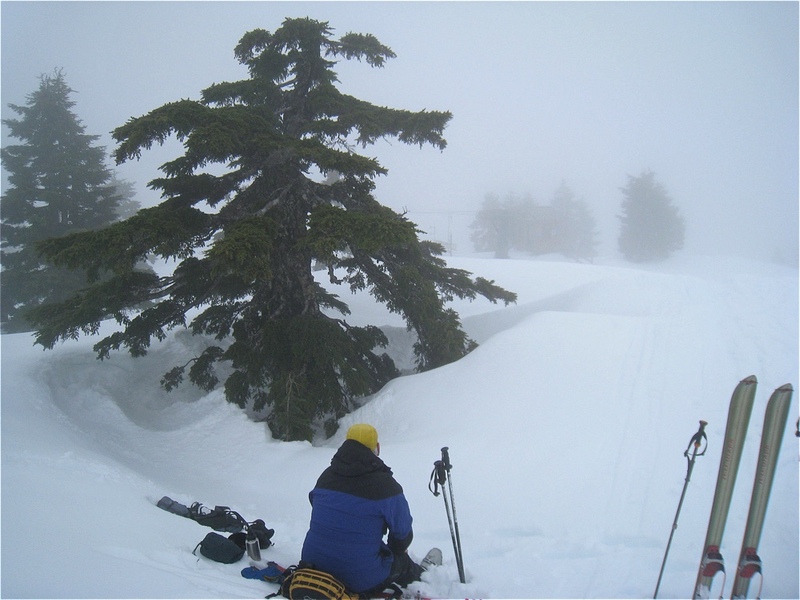 If you scroll back to last year at this time in this blog, you’ll see we were walking up the hills around Cypress Bowl to find some snow to ski. Not this year! The snow is deep right down to the parking lot at the top of the paved road. Last Tuesday I noticed that outside the lift shack at the top of the main ski lift (no longer in operation for this season) there was a small deck with a stack of plastic beach chairs (short legs). On Sunday there was a group of people using the chairs and enjoying the view and sun at Cypress Beach (elevation 4130 ft.). The snow on the mountains that form Cypress Bowl is deep even down to the parking lot at the top of the paved road. The spring snow is rapidly vanishing in the local hills, and I wanted a tougher test for my system of replacing hiking boots with trail runners. 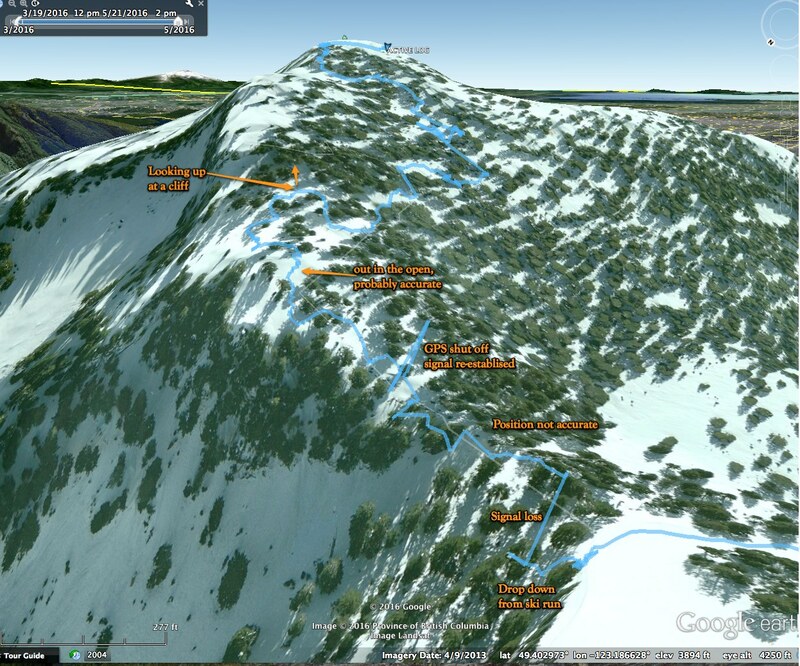 On May 21 I suggested to my hiking buddy that we leave the skis behind and head up for a local bushwhack. Click here for a full description of the system. Disclaimer and warning: this article describes a route that is potentially dangerous, and is therefore not a recommended hike. A fall is very possible and could be fatal. The north face of Hollyburn Mt. 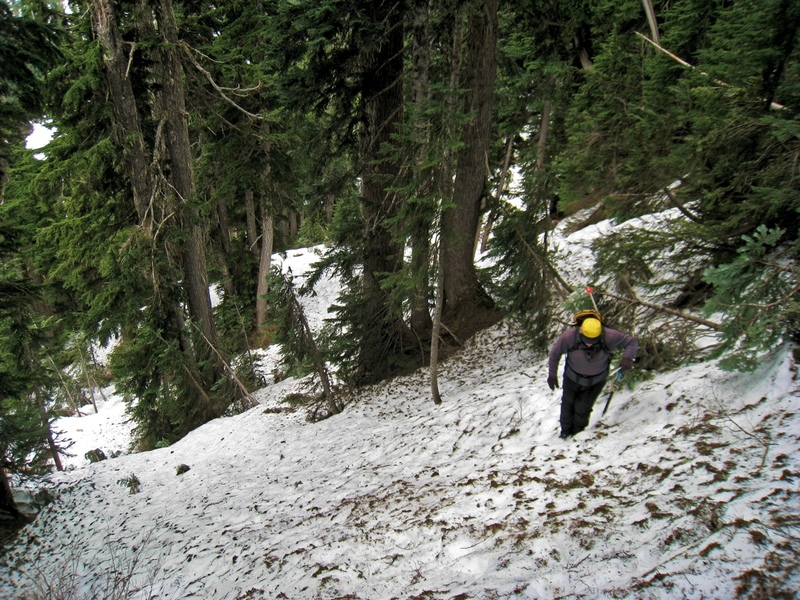 is very steep, gnarly, and drops into a deep gully. Rescue would be difficult. Although this is close to urban Vancouver, the old trail is no longer completely marked, and the spring conditions increase the hazard. Wayfinding is difficult, the weather is changeable and very different from that at sea-level, and there are no easy ‘escape’ routes. This article is a report, and is not advice to adventurers. I had heard that there was an old trail that leads from Mt. Strachan, over to Hollyburn Mt. via a steep ridge. I thought we’d be on spring snow most of the way, and the steepness would give me a sense of how the Saucony trail runners and Microspikes managed in conditions that are typical in these mountains. Since I am taking the pictures, you are looking at my companion, yet I am discussing my experience with my footwear. These are thumbs, click for full-size images. The ‘system’ is a Saucony trail runner with Gore Tex, Microspikes, and short gaiters. GPS track on Hollyburn Mt. Note the drop-off to the climbers’ left. 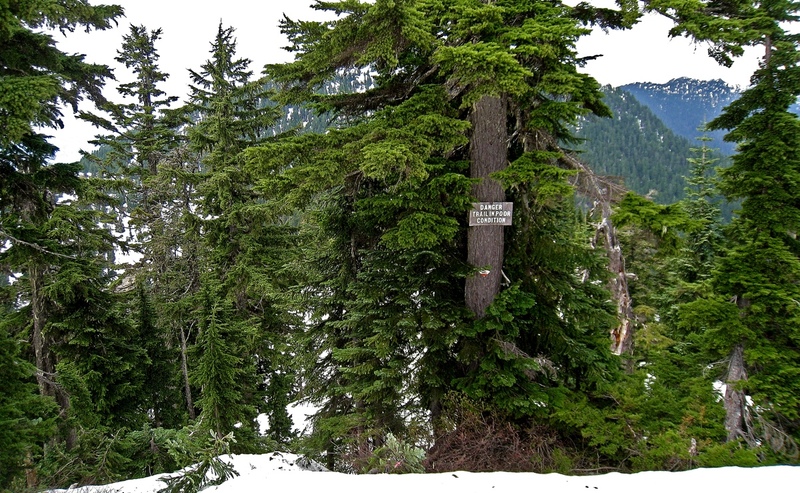 A tag on a tree showed that the beginning of the trail was a narrow vertical line with a horrific drop to the left. At first we were on and off snow. The Microspikes provided me some grip on both. There were no more trail markers and we were just bushwhacking. Side-hilling meant kicking my shoe into the slope. I love being up and alone in these high old forests. As we emerged onto the summit dome we looked back and saw the warning sign. What worked with those shoes, and what didn’t? Generally, I am thrilled with the system. The runners are not boots, and kicking steps in the snow worked because while the snow was often hard, it was not icy. Runners are much softer than boots, so I was kicking tiny toe-holds and I blew out more steps than I would have with boots, but I never really felt insecure. 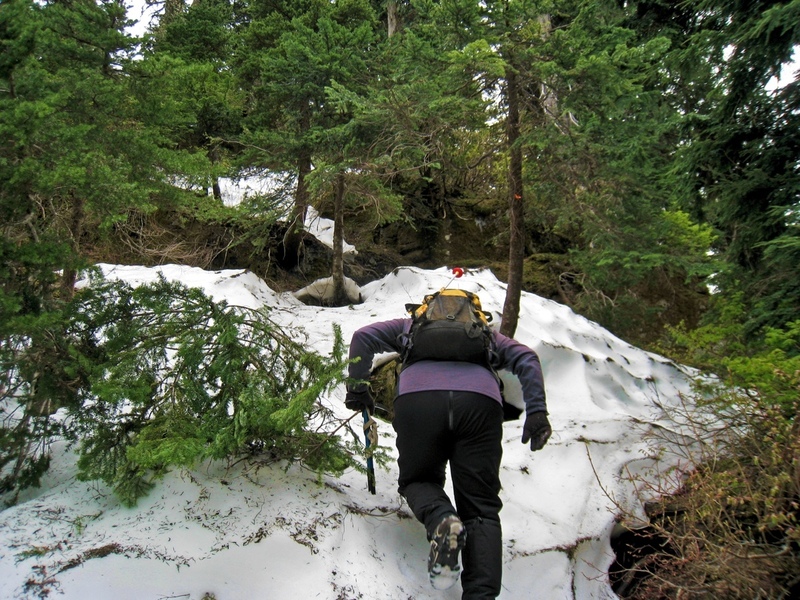 The Microspikes are not as aggressive as crampons, which meant that when it was really steep I could not keep them from slipping — I was better to kick a hole for my toe, or better-yet, zig-zag up the slope in a diagonal ascent. For this manoeuvre I was kicking the side of my shoe into the slope until I had a little shelf to stand on. Here, I found I had to be careful. While boots would provide the support to keep my foot flat, the runners could allow my ankles to roll out and lose the grip on the hill. It required a slight adjustment to my technique. After an hour or so with the shoes constantly in the snow, my feet became cold. This didn’t bother me because this has always happened with my hiking boots. Also, the boots became much heavier as they became wet. The runners are so light that I was amazed at how easily I could keep climbing. I felt 15 years younger. For me, this is a wonderful revelation! There was a bit of sun and dry rock at the summit, so as we rested I took off my shoes. By that time my feet had already begun to warm, and I was pleased to find that my feet were dry! I am very impressed with the Gore Tex liner in these shoes. While on the way down the benign southern aspect of Hollyburn, plunge stepping down every steep slope I could find was fun. 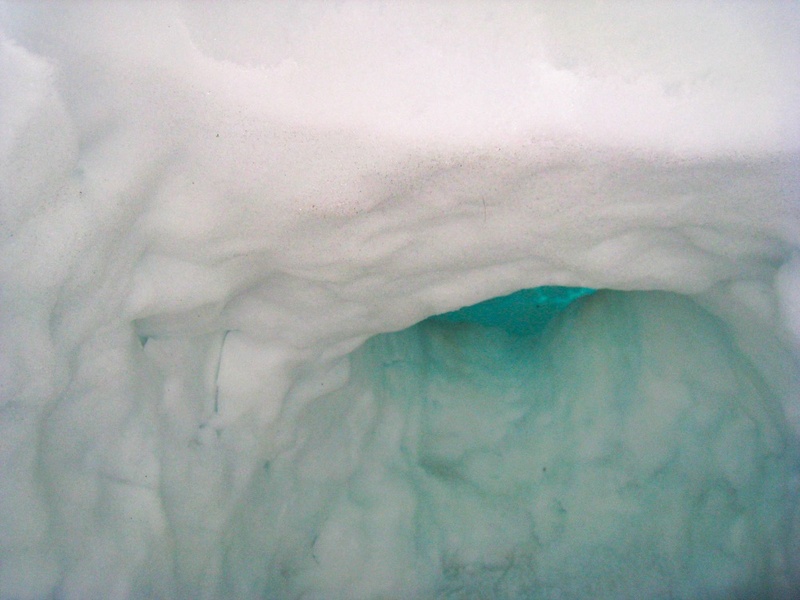 At one point I put my foot through a cavity under the snow and into a stream of melt-water up to my ankle. My ankle came out damp, but my foot stayed dry. The next weekend we were back in the hills where the heavy rains had produced several inches of new snow at the top. I happily tramped through the spring snow in my runners. Microspikes are for more than ice: I am pleased at the security that the Microspikes provided walking across wet and sometimes mossy ground where the snow had melted. Conclusions: These runners are not for mid-winter, high altitude, cold hiking and climbing. 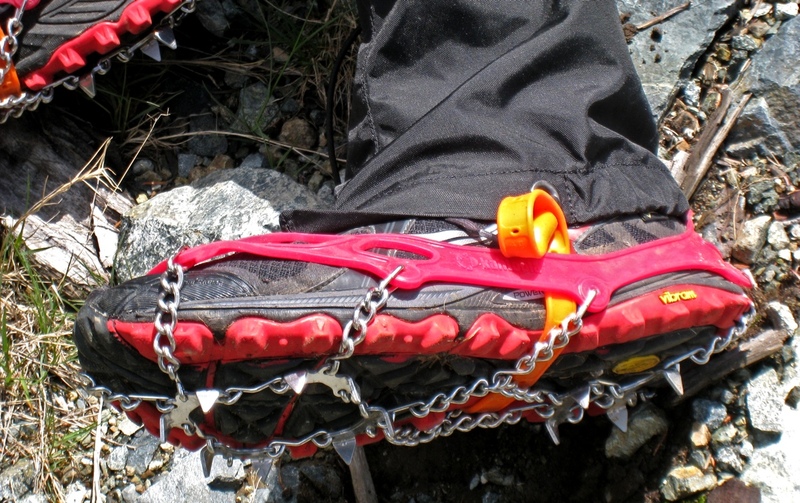 For everything else, they are truly a breakthrough development for my hiking. I will try warmer socks for the shoulder seasons. 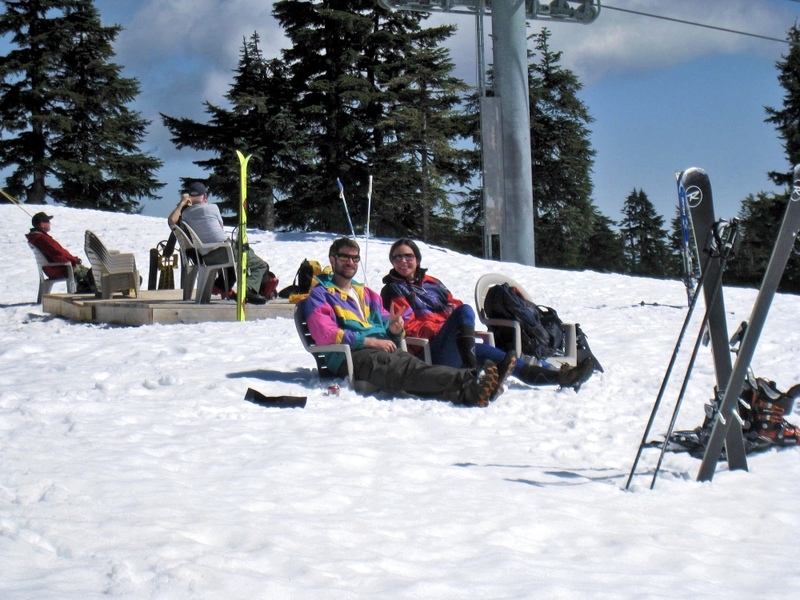 On Sunday, May 1, we headed out late in the day, so we were looking for nearby snow — and that usually means on the hills above Cypress Bowl in West Vancouver. 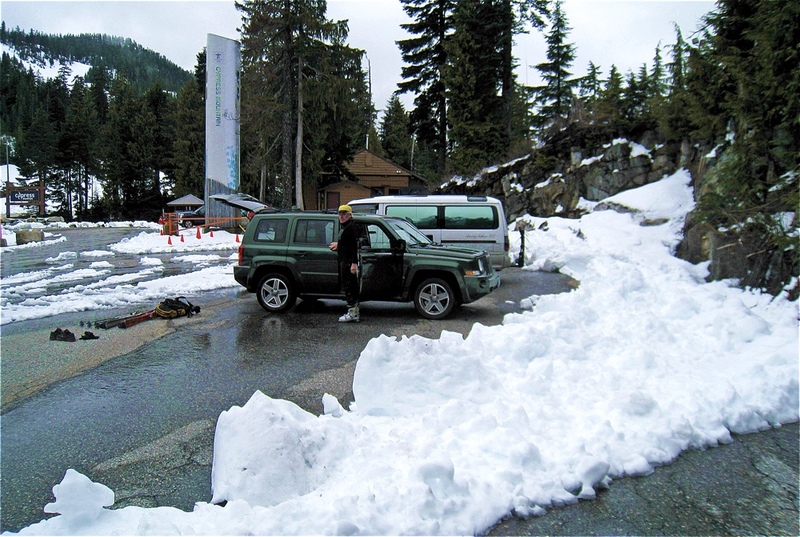 It is a short drive up a paved road from sea-level to park at at the ski resort, which is now closed for the season. Elevation: 3,000 ft. The site was fairly quiet and access is free. The sun was warm in a deep blue sky. There were some scraps of snow on the ground left over from winter and people come to hike and sunbathe — its sometimes nicknamed Cypress Beach. 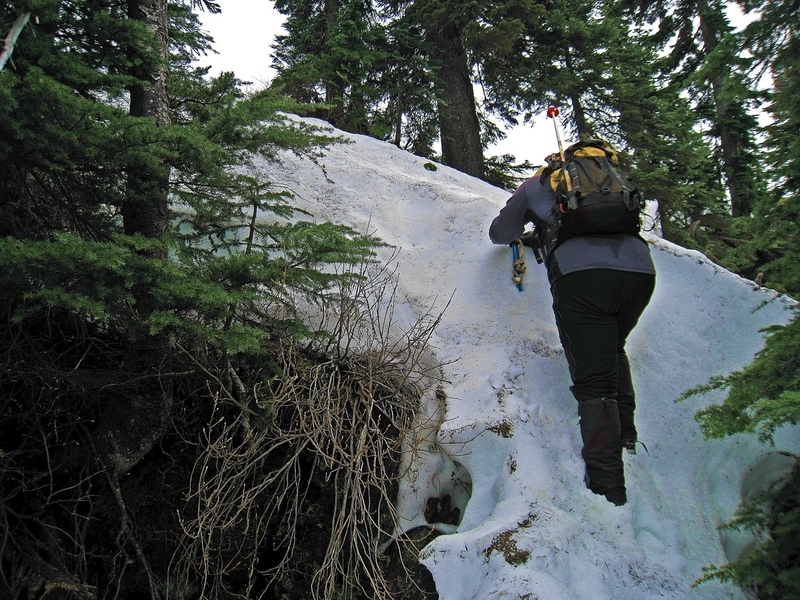 After skinning up the hill to 3,600 ft, there is only a little snow left on the ground. From the parking lot you’d wonder if it were really possible to ski here. He lost this ski on this run last winter. It must have scooted down the hill for a couple of hundred metres. He has just found it today in the trees below this spot. Suddenly, above 3,800 ft. the snow is deep and plentiful. It almost seems like rugged backcountry — Crown Mountain through the trees. 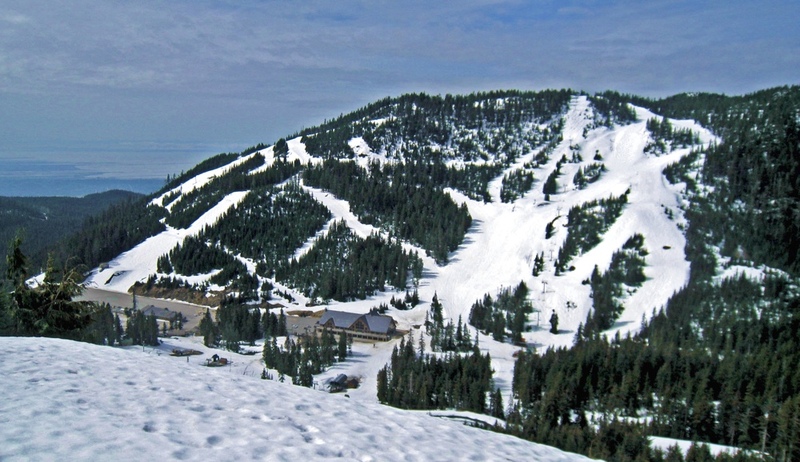 Looking at the summit of Hollyburn Mountain from the ski runs on Mt. Strachan.